We can’t promise that having an impact that can potentially save lives is easy work. But we can guarantee that it’s fulfilling, fun, and you will work with one of the best teams in the world. Work alongside smart and talented peers, strong leaders, and amazing customers to help protect the innocent. Magnet Forensics employees know their work makes a difference in the world every day. No matter what role you play, you have an opportunity to help make the world a better place. At Magnet Forensics, we build technology that will help forensics professionals deal with issues that impact justice. We live in a world where smartphones, computers, and tablets are used regularly in criminal activity. And it’s not slowing down. Our team is always thinking ahead, looking at the latest trends in forensics and understanding criminal behavior to offer the best solutions. You are not a number at Magnet Forensics. Every Magneteer has a voice and everyone is a part of a fun-filled, trusting, and selfless group. Whether your successes are work-related or a major life event, we all come together to make it special. Learn more about what makes Magnet Forensics a great place to come to work. We’re a fast-growing company and we want you to grow with us. Magnet Forensics is a great place to do fulfilling work and be rewarded as you grow in your career. Hard work is rewarded and we find opportunities to celebrate with each other. Our competitive compensation packages go beyond salary, with excellent vacation, corporate events, volunteer opportunities, and more. Leadership is something we take seriously at Magnet Forensics. From top to bottom, everyone rolls up their sleeves and gets involved in making this company great. Each leader trusts their team – we succeed together and we have fun doing it! Progress can only be made if everyone is in it together. With mentorship, development opportunities and a team that’s always willing to chip in whenever necessary, you’ll have what you need to achieve great things. If you don't see a role that fits your skill set, don't let that stop you. 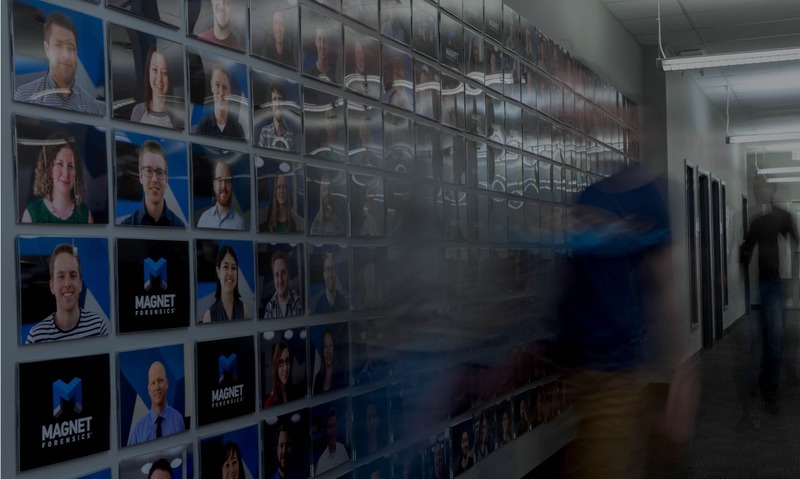 Reach out to us at hr@magnetforensics.com — we're always looking for smart, motivated people to join our team. And check back often. We’re growing fast and we’ll be posting new jobs frequently.